​A prominent politician and several other activists have smoked marijuana in front of the Polish Parliament as part of their campaign to legalize cannabis in the Eastern European country. With police looking on, Janusz Palikot, the head of the left-wing Palikot’s Movement, took a few tokes from a joint under falling snow on Friday to make his point, reports the Associated Press. 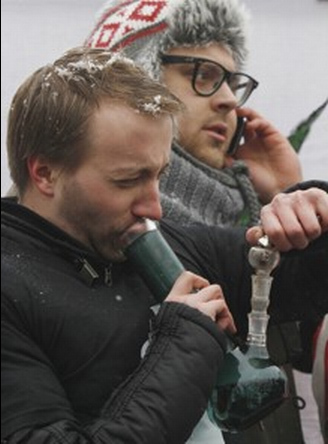 At the center of the rally was a banner showing a green marijuana leaf and the word “Legalize.” The smell of burning cannabis was heavy in the chilly air during the demonstration, which took place across the street from the Sejm, the lower house of Parliament. Palikot had last month promised to smoke marijuana inside the Parliament building, but backed down after threats of arrest and merely lit some cannabis-scented incense. Palikot was later threatened with a year in jail for even talking about smoking a joint inside Parliament. ​Activists at the protest said they want to change Poland’s laws to legalize the possession and consumption of cannabis. Poland loosened its laws last year to allow small amounts of cannabis for “personal use,” but the protesters said this is too imprecise and is insufficient. Marijuana use was largely tolerated during the Communist era in Poland, but it wasn’t openly talked about in public. With Solidarity’s victory over the Communist Party, the Catholic church started controlling public policy and the country criminalized drug use and instituted restrictive abortion laws. 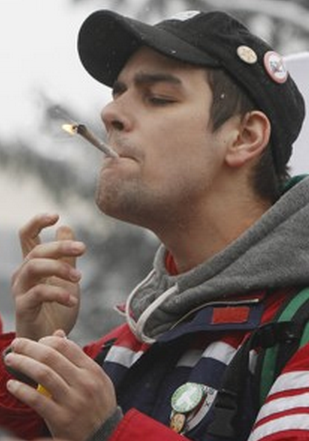 The act is part of a “coming out of smokers of weed,” said Stelios Alewras, a 26-year-old who took part in the rally. “I am a lawyer and we want to show that smoking pot is a normal thing like drinking beer,” Alewras said. “Vodka is more dangerous than marijuana,” said Mateusz Klinowski, a law professor and head of the Polish Drug Policy Network, which lobbies to decriminalize soft drug use.